Cash purchases and solar leases (or PPAs) are no longer the only options for property owners who want to go solar. For solar shoppers who lack the capital for a cash purchase but want to maximize the financial benefits of their solar energy system, the solar loan offers the perfect solution. This video reviews types of solar loans and their benefits. There are many solar loan options available to you. With a solar loan, you can save 40-70% over the lifetime of your solar panels. Many are $0-down loans, and allow you to finance the total amount of your solar panel system. 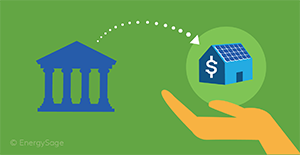 Many different types of institutions offer solar loans, from traditional banks to solar panel manufacturers. Solar loans have the same basic structure, terms and conditions as other home improvement loans. Solar loans offer immediate returns by saving you money on your electricity bills right away, even as you repay the loan. The EnergySage Solar Marketplace helps you find and evaluate your solar loan options, as well as high quality pre-screened solar installers. A solar loan allows you to own an asset that generates significant savings. Like any other financial product, solar panel loans have different structures, terms, and conditions. In order to find the solar energy loan that is right for you, there are two fundamental questions that you need to ask. Read more about secured solar loans and unsecured solar loans. In addition to traditional banks, there are many other institutions that offer solar energy loans. Solar panel manufacturers offer loans, often through their solar installer networks. Credit unions all over the country are developing solar energy loan products for homeowners, and often offer lower-cost solar loans. National lending institutions offer specialty loan products tailored to residential solar panel systems. Public-private partnerships can offer solar energy loan programs. Local government agencies partner with private lenders to offer solar loans with lower interest rates and no fees. Utilities offer on-bill financing programs that allow homeowners to finance solar energy systems and repay the borrowed amount through electric bills. Municipalities sometimes offer PACE (Property Assessed Clean Energy) solar energy financing, which are repaid by an annual assessment on property owners’ property tax bill. Review a full list of companies that offer solar loans.